Of all of the free publications circulating about China, the Jamestown Foundation’s China Brief has frustrated me the most – but in a good way. 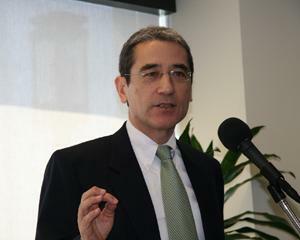 When I first started reading China Brief, I was struck by the number of authors who were unrepentant Panda Punchers, people like Gordon Chang (pictured) who seemed more interested in foisting a negative perspective on the PRC than on adding insight to the debate. There is still some of that, as Chang remains a contributor and Willy Lam is a columnist. Under the editorship of Peter Mattis, who comes out of the National Bureau of Asian Research and the U.S. Government, the publication has become less shrill but much more insightful. The tone is serious but not so academic that it is off-putting. The style strikes a balance between the insider insight of The Economist and the deep-diving thoughtfulness of professional and academic journals. In short, it belongs in the inbox of any regular reader of The Peking Review. I have to confess that the fortnightly arrival of China Brief means that I don’t always get to read through the whole publication, but I feel intellectually naked if I don’t at least scan its pages. The China Brief is a free download. This entry was posted in China, Daily Reads, International Relations and tagged Asia, China, Economist, Gordon Chang, Jamestown Foundation, Maps and Views, National Bureau of Asian Research, Peter Mattis. Bookmark the permalink.